Many businesses are looking at consumables for areas in which they can save money. While electricity and gas are the ones most commonly focused on, water is another area that savings can be made. 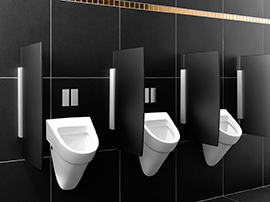 One of the ways that businesses with washroom facilities can do this is through urinal water saving systems. TWC Group offer this service to our customers to help save water. Not only can we install them for businesses around the North East, Yorkshire and Lincolnshire but we maintain them for you, giving you one less thing to worry about. All the devices are approved under the latest standards and can help reduce water consumption in this area of your business by up to 90%. These devices, that regulate the flow of water through urinals, ensure that water shuts off when not in use. Facilities that run water longer than needed are one of the biggest sources of waste in washrooms and these flow saving devices can minimise the water used without affecting the service. We can also offer urinal sleeves to help make the space smell better but also to reduce the chance of blockages in the pipes leading to back flow of water into the room. It also creates a pleasant smell and makes for a better environment for guests and customers. We can pair this service with any of our other washroom services to cover all your needs. Each package is personalised to your business to get the services you need. Your local urinal water saving system provider. We provide our full range of urinal water saving systems across the whole of North Yorkshire, East Yorkshire, West Yorkshire and South Yorkshire, operating out of our locally based depots situated in Hull and Thirsk. Our urinal water saving systems in North Lincolnshire include our full offering and covers locations such as Scunthorpe, Grimsby, Brigg, Barton-upon-Humber and all the surrounding towns and villages across the Humber region. The urinal water saving systems detailed are available to customers located in the North East region, including cities such as Middlesbrough, Durham, Sunderland, Newcastle, Gateshead and all of the nearby towns and villages.